I haven't used Depilatory cream in years. Two main reasons was because they never worked well for me and the smell. The smell is just eye-watering and nose tingling uncomfortable. 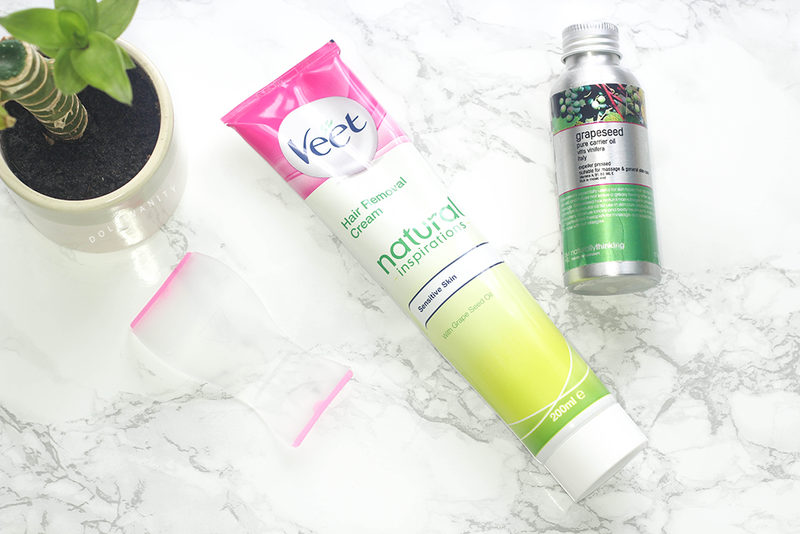 Veet recently launched the Natural Inspirations with hair removal that includes oils within the ingredients. This one in particular has grapeseed oil and is for sensitive skin. I decided to re-try hair removal cream. The one place that I would really see how it works is on the bikini line. Being that the hair is more coarse, I do want to see how it will work on the coarsest hair because if it works on that..it'll work elsewhere easily. Within the box you get the hair removal tube and a double ended spatula. One side of the spatula you will use it spread on the cream evenly. Wait around 6 minutes and use the other side of the spatula and remove a small area to see if it's ready to be completely removed. Once I do that, I do notice that it removes very well but I do need to go over it with a razor just for a more cleaner feel as the hair can randomly cut some pieces off not as close to the hair root as I would like but it does an overall good job of removing the hair. This hair removal as previous ones I have tried does still smell. Not pleasant but not as strong as I remember but it has been years. My friend has always said to me the smell reminds her of hair relaxer, while researching the ingredients I found out the active ingredient is a compound known as Potassium Thioglycolate. This is is one of many compounds that are derived from Thioglycolic Acid. You'll find Ammonium Thioglycolate aka perm salt which is an ingredient in relaxer is also derived from Thioglycolic Acid, the odour comes from the sulfur content that the Thioglycolic Acid contains. You'll notice that when you put the cream on the hair over minutes begins to lengthen and straighten like it would a hair relaxer for hair. It's breaking down the keratin bonds within the hair with the help of Calcium hydroxide so when you begin to remove it, it snaps off. Thioglycolate are less likely to irritate your skin but that's not to say there isn't irritants within the ingredients such as paraffinum liquidum and possibly the parfum. It's a shame to see Grapeseed Oil so far down on the ingredients list, I'd like to of seen it higher up to know there was more of it in but then I'm not a chemist and the ratio may be sufficient enough. I did have a problem with using it the first couple times and I would probably bare the smell to have less irritated hair removal on my bikini line. As mentioned this one is for sensitive skin, there's also one for normal skin that contains shea butter. Also within the Veet Natural Inspirations range, you can find a waxing kit, that's for all skin types. Do you or have you used hair removal cream?